Online assessments Our online exam software is protected with passwords, secured with SSL certificate. Only verified candidates are registered. Paper Based Exam There are many chances of fake students appearing for exam. There is possibility of paper leakage while passing it to different exam centers. Online assessments Online exam can be conducted where candidate appear from anywhere at remote center. So hundreds or thousands of students can appear from various location. Cost per candidate can be around Rs50 to Rs.200 including examination center cost. Paper Based Exam Paper based exam would cost more than Rs.300 to Rs.400 per candidate. There is also need to manage classroom infrastructure, question paper, and answer sheets. Online assessments Logistic cost is minimum. Online assessments There is Online Exam can be managed in auto surveillance mode where web camera connected to the system would take snapshot of the student appearing for the exam. This would ensure that same student is appearing for the exam and system is able to keep track on student during exam. Shuffle question and answers in our online exam software used to stop cheating in exam. So that each student won’t get same exam paper. Paper Based Exam Every time for conducting exams supervisor is required. Live Exam center is the best online exam software in Pune. This is the most flexible online assessments in Pune where admin has maximum controls over online exams. Above reasons will clearly show you advantages of our online exam software in Pune over traditional Paper based exam. 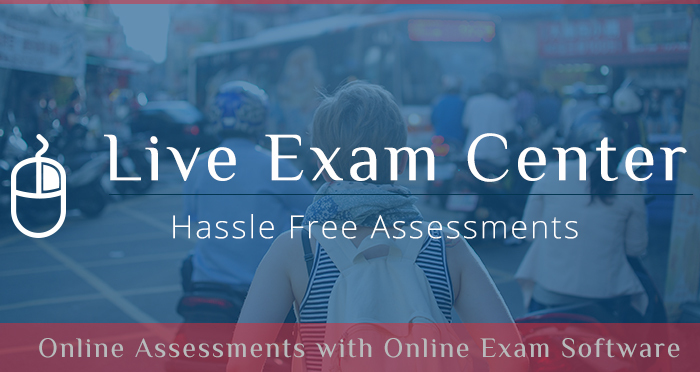 Live exam center is online exam software for colleges, schools or institutes for conducting online exams with hassle-free way.